I was inspired by white out challenge at A blog named Hero. I was playing with the embossing folders and came up with the idea of combing two different ones for one background. No glue. The image of the all time favorite Hero Arts stamp Hydrangea was colored with a paint brush and distress inks and then die-cut. I cut a strip of the veil. As it is stretching well, it is easy to work with. I wrapped and tied the veil strip and cut a hole for the brad in the die-cut, added glue to the die cut, fastened the brad and then glued the die cut, so the back of the card is problem-free. 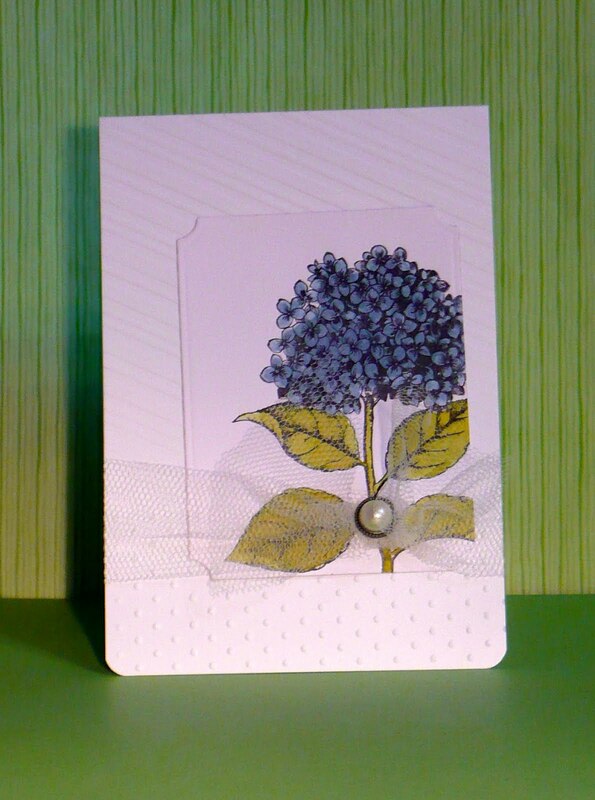 I recently enjoy making simple cards, as I need a lot of them, they are gone quickly like hot pies. This card makes me think of a wedding, but not as a gift card, but as small thank you cards that the married couple gives to the guests and helpers. TFL! What a beautiful, elegant card Maria - I love how you added the veil too!